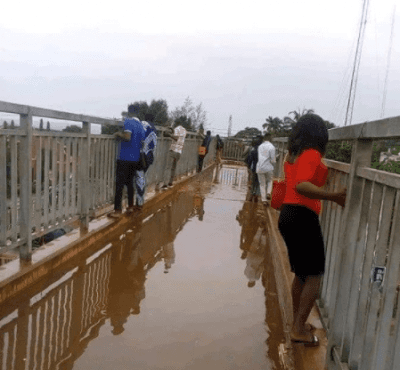 A twitter user shared a picture of how students of Federal Polytechnic Auchi had to cross the flooded pedestrian bridge this morning. He also noted in his post that this was as a result of the rainfall that was witnessed yesterday, being the first rainfall in Auchi since this year. He is pleading with the school management to find a way to curtail this damage. He is also scared for students not to fall off the bridge.